When Phil Bredesen started running for mayor, he had been downtown so infrequently that he had trouble finding Fort Nashborough, the park where his campaign had scheduled his kickoff event. By the time he left office after eight years, Bredesen had transformed downtown Nashville. A place most people once preferred to avoid had become a beehive of energy. Although he had lived here for 11 years before his first campaign, Bredesen, who had founded, built and sold a large health care management firm, was still a political outsider in a number of ways: born in New Jersey, raised in New York, educated in Massachusetts. But his willingness to think big – and to take political risks to realize his vision – ultimately transcended all of that. His first run for the city’s top office failed in 1987, despite the money he poured into it from his health care fortune. His “not from here” status was a political liability at the time, as was the fact that his wife, Andrea Conte, had kept her own last name. When Bredesen returned to the political arena in 1991, the man who had beaten him four years earlier had decided to move on from the mayor’s office after gleefully broadcasting his own personal indiscretions on a daytime TV talk show, briefly making Nashville a laughingstock. And with that, the political field was wide open. When he took office in 1991, Bredesen saw a city government overly focused on the short term – the yearly operating budget – and not thinking enough about capital projects, or “civic furniture,” that could change the landscape and make Nashville more attractive. He also saw a downtown riddled with adult businesses and prostitution. Downtown “wasn’t a place you even thought of going,” veteran record label executive Joe Galante says. Downtown resident, businessman and philanthropist Steve Turner remembers a city in serious danger. Remaking downtown was the biggest issue of Bredesen’s first term. The area needed an anchor or two. The new mayor tried to figure out what that should be. More retail? The city already had more than enough of that, his research found. Maybe a university campus? Those talks went nowhere. Critics also said a downtown arena wouldn’t be successful “because Lower Broad was dangerous and there were too many prostitutes and too many druggies and we needed to spend more money on policing instead,” Bredesen recalled in his office on the 20th floor of The Pinnacle at Symphony Place, two blocks from the arena. What Bredesen didn’t have an answer for at the time was the question of which professional sports franchise would be the arena’s major tenant. Still, he pressed ahead, and the Metro Council eventually accepted his arguments, agreeing in June 1993 to finance construction between Broadway and Demonbreun Street and between Fifth and Sixth avenues. When it came time to review arena designs by five competing teams of national and local architectural firms, country music star Vince Gill was on the committee with four architects and the late Anthony Mason, who played basketball at Tennessee State University before starting his 13-year NBA career. Gill said Bredesen wanted to be sure a couple of people who spent a lot of time in arenas could weigh in. Only one of the teams of architects had drawn the facility to face the Ryman Auditorium and the honky-tonks of Lower Broadway; the rest were oriented to the south. Gill said the committee voted for that design by HOK Sports and Hart Freeland Roberts. 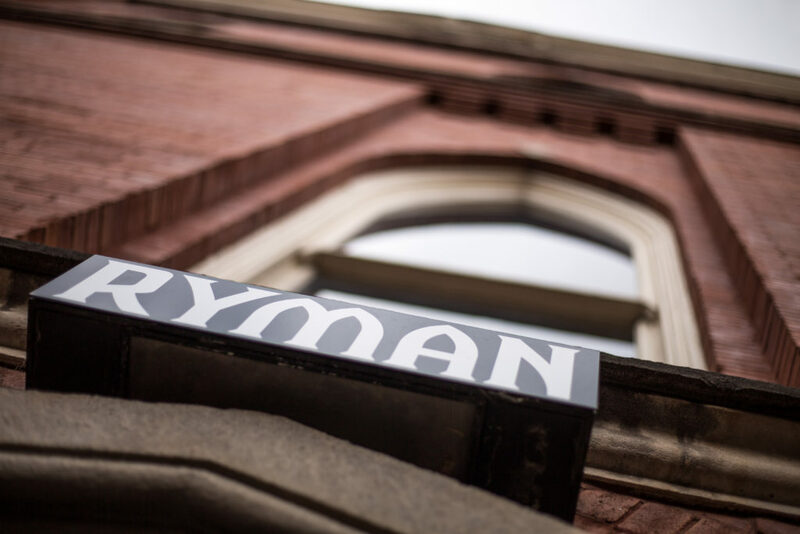 “In a spiritual way, it was kind of cool that they were paying homage to the old gold standard of buildings for our city,” Gill says of the Ryman. Around the same time, that “old gold standard,” which once appeared to have been left for dead, was coming back to life. The Ryman Auditorium is one of Nashville’s most historically and culturally significant buildings. Built in the early 1890s by riverboat captain Thomas Ryman, it was designed to be a tabernacle large enough to house the revival meetings held by fiery preacher Sam Jones, who had converted the initially skeptical Ryman. When Ryman died in 1904, Jones, presiding over the funeral, proposed renaming the building for the builder. The audience voted unanimously in favor. But the Opry eventually got tired of the old, hot building and the atmosphere on Lower Broadway, which wasn’t family-friendly, said David Ewing, a Nashville attorney and historian who has studied the Ryman’s history. So it moved to the Grand Ole Opry House off Briley Parkway. Without the Opry, some people felt the Ryman didn’t have much reason to exist. Roy Acuff, the “King of Country Music,” apparently didn’t need a church to continue his reign; he said demolition was a good idea, according to The Tennessean. National Life and Accident Insurance, the company that started WSM and owned the Ryman, agreed. Historic preservationists managed to ward off the demolition threat, but the Ryman typically sat empty, though it did occasionally serve as a film and TV set through the 1980s. Gaylord Entertainment Co., now known as Ryman Hospitality Properties, bought the building in 1983 from American General Corp. – which had acquired National Life and Accident and its assets – and began exterior renovations in 1989. In the spring of 1991, Emmylou Harris and her Nash Ramblers band recorded a live album in the 99-year-old facility. Peter Cooper, museum editor at the Country Music Hall of Fame and Museum, said Harris had to get special permission to make the record at the Ryman, and no one was allowed to sit in the balcony, for fear that someone might get hurt. Only a few hundred people were able to attend each show. Ewing said the building’s history never faded that much from public consciousness. Tours were still offered after the Opry left, and “Coal Miner’s Daughter,” the movie based on Loretta Lynn’s life that came out in 1980, was partially filmed there. “It was known and respected by most Nashvillians,” Ewing said. Harris and the Nash Ramblers weren’t the only ones piercing the chaos of Lower Broadway when they played the Ryman in the early 1990s. Some old-but-new sounds were ringing from the honky-tonks. A band called BR5-49 (or BR-549, or the hyphen-free BR549) started performing at Robert’s Western World, a former steel guitar manufacturing facility. 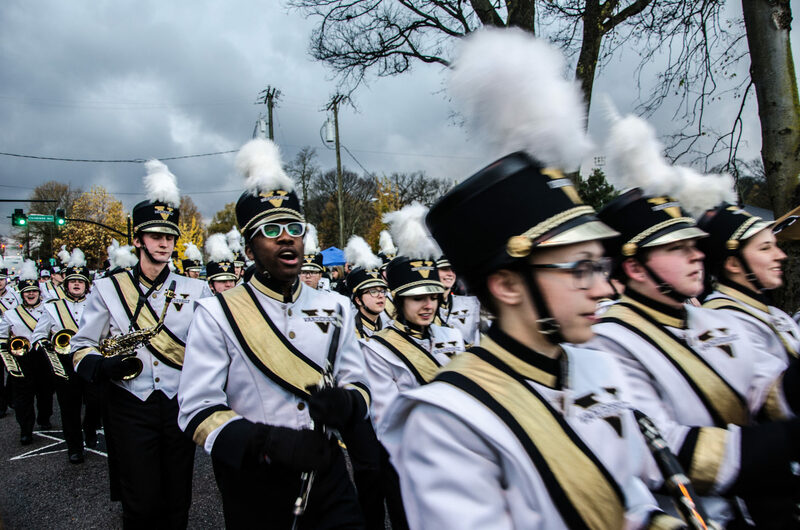 They played “real deal, old-school, hillbilly music” that attracted Vanderbilt students, tourists and other listeners to Lower Broadway, Cooper says. Around the same time, Greg Garing started “playing traditional country music in an exciting way” at Tootsie’s Orchid Lounge, a honky-tonk that opened in 1960 across an alley from the Ryman. In 1992, Gaylord announced it would fund a major renovation and expansion of the Mother Church of Country Music, which reopened as a 2,362-capacity concert hall and events venue on June 3, 1994. The Ryman was designated a National Historic Landmark by the National Park Service in 2001. “Every time I sit and watch that, I always get flushed in the cheeks when we get to the part about (National Life and Accident) under pressure and thinking about tearing it down,” Reed says. “I can’t imagine this town without that Ryman today. The Ryman Auditorium, which once appeared due for a date with the wrecking ball, now hosts a busy calendar of concert dates spanning many genres each year, including the Grand Ole Opry in the winter months. It has been named Theatre of the Year by Pollstar magazine for each of the past six years. And it seems that everyone who performs at the Ryman, from today’s Opry performers to British pop stars, worships at the historic venue’s musical altar. “This is possibly the coolest place we’ve ever played,” Coldplay’s Chris Martin said on stage in 2003. Ketch Secor, the fiddle and banjo player who leads the band Old Crow Medicine Show, says Thomas Ryman had a vision, and now a much larger audience can enjoy what came of it. 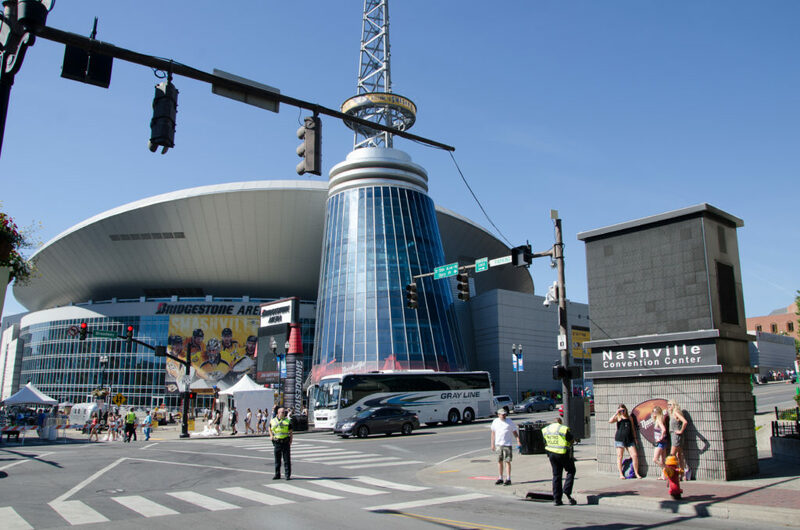 Bridgestone Arena was the centerpiece of Mayor Phil Bredesen’s move to bring new life to downtown after he was elected in 1991. The new tower made a statement that downtown wasn’t dead. Nashville real estate developer Bert Mathews said the city’s decision to offer AT&T incentives to move downtown helped spur the Ryman’s renovation. Two years later, Nashville’s arena opened in December 1996 at a size dictated by the needs of pro sports teams, who said they couldn’t fill the 24,000 seats Mayor Bredesen initially envisioned. But there was still no team to occupy the 17,113-seat facility. Relocation talks with the National Basketball Association’s Minnesota Timberwolves and the National Hockey League’s New Jersey Devils had been unsuccessful. The first event at the building now known as Bridgestone Arena was a concert by Amy Grant, whose special guests included Gill, her future husband. The arena hosted its first nationally televised sports event, the U.S. Figure Skating Championships, in February 1997. Then pro sports finally came calling. The NHL awarded the city an expansion hockey franchise in the summer of 1997. The Nashville Predators skated onto the arena’s ice for the first time on Oct. 10, 1998, beginning an epic journey that would eventually bring one of hockey’s greatest events to the city. Four weeks earlier, another major league team started playing in a temporary home at Vanderbilt University. The city was building the Tennessee Titans’ permanent football stadium just across the river from downtown, the hard-won product of another opportunity Bredesen had seized – even though he had little interest in football.